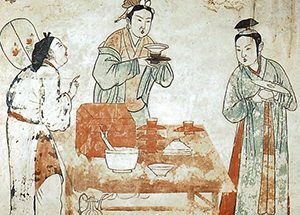 Tea likely originated in southwest China during the Shang dynasty as a medicinal drink. After water, it is the most widely consumed drink in the world 😊 It was popularized as a recreational drink during the Chinese Tang dynasty, and tea drinking spread to other East Asian countries. Portuguese priests and merchants introduced it to Europe during the 16th century. The word is pronounced differently in different varieties of Chinese, such as chá in Mandarin, “zo” and “dzo” in Wu Chinese, and “ta” and “té” in Min Chinese. The European world adopted the word “té” into “tea” and much of the orient calls it cha, or chai. Before the 1500s, tea leaves came in bricks like this one. Lao-Tsu, the classical Chinese philosopher, was said to describe tea as the “froth of the liquid jade” and named it an indispensable ingredient to the elixir of life. 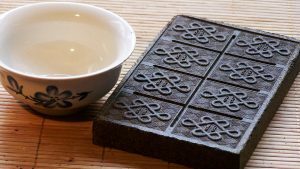 During the 6th century CE, the Tang Dynasty produced Teas in the form of bricks. They were often used as currency, especially further from the center of the empire where coins lost their value. During the 17th century, drinking tea became fashionable among Britons. Britain was buying huge quantities of the stuff – it was top of the national shopping list above other exotic Chinese goods like silk and porcelain. The problem was the Chinese didn’t reciprocate. They weren’t too keen on anything produced in the rainy little island that was the centre of the European tea trade. This was a recipe for economic disaster. The British then tried to manipulate the tea market in the New world. The colonists in America – another booming market for tea – were not pleased. 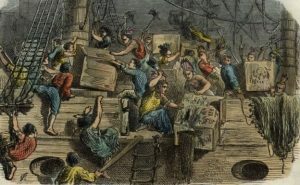 The historical Boston Tea Party, on July 4, 1776, where the colonists tossed a shipload of tea that had arrived from Britain into Boston harbour, began America’s War of Independence from the British. With the Americas breaking away, Britain’s insatiable appetite for tea was well on it’s way to bankrupting the entire nation. The breakthrough came when the East India Company discovered the one thing that the Chinese did want to consume – Opium. It started massive scale production in Bengal, encouraging farmers to grow more, reorganising production and developing new cultivation techniques. When the Chinese emperor protested that the drug was creating millions of addicts, he was ignored. 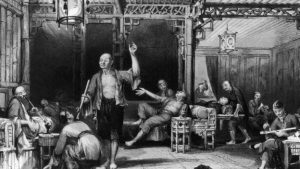 A good 25% of men in China were opium addicts at the time. The Chinese soon made the trade in opium illegal, but the East India company sold it in the Chinese black market to feed a growing population of opium addicts. But when, in 1839, the emperor confiscated some 20,000 chests of opium, the British took action. They launched not one, but two wars, notoriously called the Opium wars, which opened up all of China for free trade with England, and other European powers. The Island of Hong Kong was also “annexed” by the British, and returned to China only in 1997. Meanwhile though, the bosses of the East India Company were already working on a plan to avoid future disruption of the tea market that practically all of Europe was addicted to. And, once again, India was the obvious place to start. In the 1830s, the first tea estates were established in the Indian state of Assam, using tea plants brought from China, and by offering land in Assam to any European who agreed to cultivate tea for export. Slavery had been banned in Britain by this time, so to produce cheap tea, the British introduced indentured labour to work on the plantations. 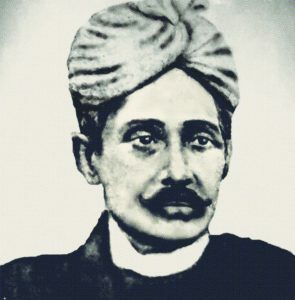 Maniram Dewan was the first Indian tea planter and is credited with establishing the first commercial plantations of the Assamese variety of tea. He later fell out of favour with the British for protesting against their harsh labour policies. 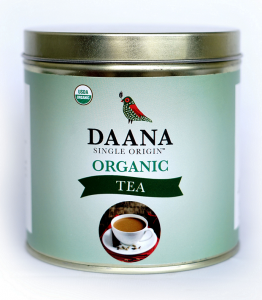 Taking a break from the history of chai, we now present you Daana’s tea. It comes from Murali’s single-estate, high mountain (2,000m/6,800ft) tea farm located in the Nilgiri Mountains of Tamil Nadu. The tea is a dark, intensely aromatic, and flavourful variety. The farm is 100% organic and we practice sustainable agricultural methods. The tea leaves are harvested by hand, immediately withered and then processed in small batches to ensure maximum freshness and highest quality. This method is called the orthodox method, as opposed to the “CTC method”. The orthodox method is more manual and time-consuming, but results in a much deeper and flavourful tea. Nilgiri teas are one of the great undiscovered gems of the tea world. The high elevation, abundant monsoon rains and the rich soil of the region is ideal for growing tea. Teas grown here are known for being very aromatic and medium-bodied with a smooth, mellow taste and subtle, natural sweetness (almost fruitiness) to the cup. Nilgiri also makes some of the best iced teas in the world; they never turn bitter, they don’t cloud, and that natural sweet note comes out (especially when you make cold-brew iced tea). The Nilgiris are one of the most beautiful tea regions in the world. A must do while visiting the region is to take the worlds cutest toy train up the hills. The Nilgiri Mountain Railway is a UNESCO Heritage Site. One may assume that, with our ubiquitous chai culture, tea drinking would be as old as the Vedas. However, chai as Indians drink it today has a relatively recent history. The drink was only introduced in the 1950s. I derive from Philip Lutgendorf’s work “The Triumph of Tea” to write this section. Before British rule, the Mughal courtly elite consumed tea in small, medicinal quantities, imported from China, perhaps via Iran. As mentioned earlier, the British started growing tea in the hills of Assam and Bengal, mainly to beat the Chinese monopoly on tea at the time, to feed Europe’s craving for the drink. The British tea producers saw no need to cultivate a domestic market in India until the Great Depression in 1933, when British consumption fell and advances in production generated a tea surplus. In 1936, the Tea Market Expansion Board launched an aggressive marketing campaign to get Indians hooked on the drink. Free samples of brewed tea were proffered in railway stations and public markets; promotional posters and literature demonstrated the “correct” (that is, English) way to brew and serve tea. The campaign’s rhetoric was not subtle: promotional materials took on the triumphalist tone of Christian missionary tracts, suggesting that the quintessentially English beverage will rescue its Indian consumers from ‘lassitude’ and ‘vice’, and will inculcate in them such desirable traits as ‘punctuality, decorum, and good sanitation’. The first Indian communities to “convert” to drinking tea were the Parsis and upper-class Bengalis, who were closely associated with the British administration. Now, it was India’s turn to resist the colonial rulers. Gandhi and other nationalists criticized tea as a foreign and imperialist product and it was largely boycotted until Independence. Post 1947, tea estates and wholesaling companies slowly passed from British to Indian hands. The major tea companies, now owned by Indians, sought to convince consumers that tea drinking was not only swadeshi, but also “conducive to both individual and national health and civility.” 😊 Farhan’s mother mentions how in the 60’s, trucks used to drive daily by their home in the Mallepally neighbourhood of Hyderabad, serving everyone free samples of chai. Technology played a crucial role in bringing affordable chai to the masses. Simpler machinery made the processing of tea cheaper by the late 1950s. Factories could now produce quick brewing teas of deep color and robust flavor, that could stand up to copious draughts of milk, resulting in a tea that tasted “kadak” and delicious whether boiled, simmered, or blended with sugar and spices by a housewife or street vendor. Tea is now made both at home and outside. The phrase “Chai-Pani” literally translated to “tea and water”, means offering welcome drinks and making guests feel comfortable. Outside the home, tea is most commonly and easily found at the ubiquitous tea stalls that dot just about every street in India. The tea stall has become a part of the urban landscape and a cultural institution. We present you with a gallery of unusual chai “stalls” we have spotted. 80 percent of the tea produced in India is consumed in the country. Small, sweet, milky cups are sold and served at all hours of the day in homes, offices, shops, and on the street. 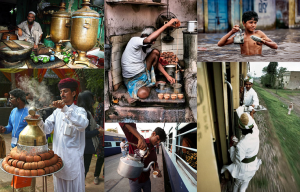 Chai prepared in this manner is the proletarian beverage par excellence: the daily fuel of office workers and informal-sector laborers and the default hospitality offering to visitors. 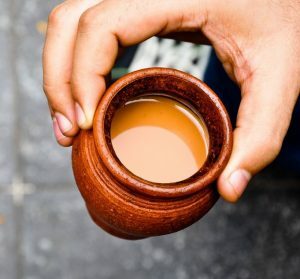 It lends itself to Mumbai’s favourite “cutting” chai, which is essentially a half serving of chai. Half the price, and you can have umpteen cups of it during the day. My favourite chai experience dates back to my college days, where, soon upon pulling into Kharagpur station on a wintry night, we were served chai in tiny kulhads (clay cups). We had to drink it up and smash the cup into smithereens under our heel. What joy !! The rise of chai as India’s national drink is a fascinating phenomenon. It went from virtually non-existent to becoming the staple beverage of the country in a period of merely 70 years. The spread of tea accompanied changes in lifestyle, rural-to-urban migration, and urbanization, and is a marker of post-independence Indian society. That begs the question to all of us Indians: What *did* we drink before chai? Well, truth be told, in the chai belt of India, it really didn’t replace anything. Chai created a new niche for itself as a very inexpensive social beverage that could be freely shared. We at Daana pay our deepest respect and salaam to Chai. We cannot imagine our day without our chai break, where we all sip it together. As with all our posts on food, we end this one with a recipe. Now, who in India needs a recipe for chai? To pique your curiosity, here’s one with a twist (of lemongrass actually), the Parsi “Choi”.